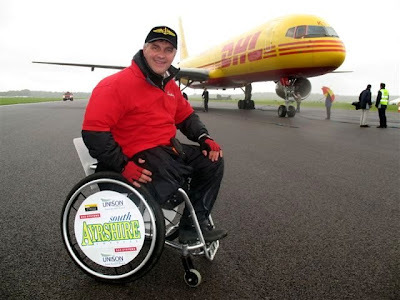 SOUTH AYRSHIRE COUNCIL employee Colin Duthie was one of a team of 36 manual wheelchair users who have successfully achieved a world record by pulling a Boeing 757 110 metres along a runway at Lasham Airfield. The British Disabled Flying Association (BDFA), who provide opportunities in aviation for disabled people, invited Colin to take part in the world record attempt after hearing about him reaching the top of Ben Nevis earlier this year in a wheelchair. Colin (pictured above) was the only person from Scotland to be invited to take part in the event. Speaking afterwards, Colin Duthie said: “It was a very exciting event, and the success of the team will shortly be confirmed by the Guinness Book of Records. The challenge took place in the wind and rain, and it took a lot of hard work and determination to achieve our goal. The crowd of over 2,500 people who came to watch gave us great encouragement, and there was a great atmosphere. “The event clearly demonstrated that even tasks that seem impossible can be achieved with teamwork and a shared vision. I will be giving presentations on behalf of the Council to schoolchildren and other groups about my experience, and I am sure that it will enable me to foster positive attitudes and perceptions about what people with disabilities can achieve. 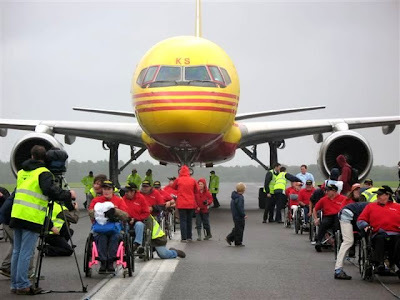 The team (pictured above) pulled the 57 tonne Boeing 757 along the runway to demonstrate what amazing things people who use wheelchairs can achieve. As part of the challenge those taking part are asked people to sponsor them, all funds raised will go to the BDFA who will use them to provide opportunities for disabled people to enjoy the excitement of flying light aircraft. 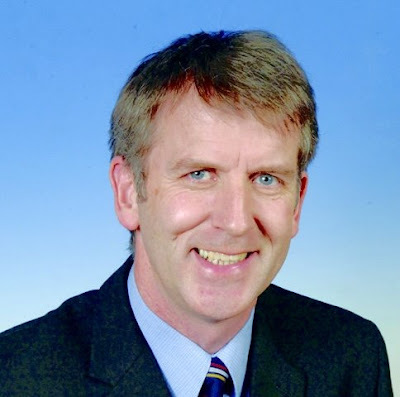 Councillor Brian Connolly (pictured above) is Chair of the Council’s Group on Equalities and Diversity. He said: “I would like to congratulate Colin and the rest of the team on their outstanding achievement. The aim of the world record breaking attempt was to change the attitudes that some people have towards those with additional support needs and to raise funds for the BDFA . There are currently 359 Ayrshire business stories permanently archived on this site. To locate those of most interest to you, please use the site search facility in the top left hand corner of this page. Type your search term in the white box, then click “SEARCH BLOG”.